This spring I decided to crochet, knit and bead, finish a lot of projects and really hit the ground running. But I picked hard or boring projects that were anything but refreshing and relaxing. So I gave myself permission to go off on a tangent, drop the projects that caused me to curse in frustration and grab those that made me rush to sit down and complete. Who was I trying to impress? No one. My crafts are fun FOR ME. They serve a purpose FOR ME so I dropped anything that didn’t give me a warm and fuzzy feeling or ripped it out. It was a revelation that has made this year of creativity different. The one exception is a shawl I just finished that was very hard for me but it is for an upcoming crochet workshop. The published pattern has mistakes and stitches I rarely use and twists and turns but I persevered and finished it. But…I’m going to rip out part of it because I don’t like the main piece of the pattern and want to try something different. Will anyone notice my changes? Probably not and really, who cares? It is fun to add my own twist to the popular shawl. I’ll post it when I re-finish it. But for now, I’ve been in bead heaven. Here are my accomplishments. The sunflower amulet bag is from a design by Amy Loh-Kupser called Summer Sunflowers. I’m addicted to her patterns. The bag can be made into a necklace or used as a credit card case or whatever you want. I chose to make this one into a necklace and agonized over the embellishments for days. Finally I realized it was finished, adding anything else would detract from the design. 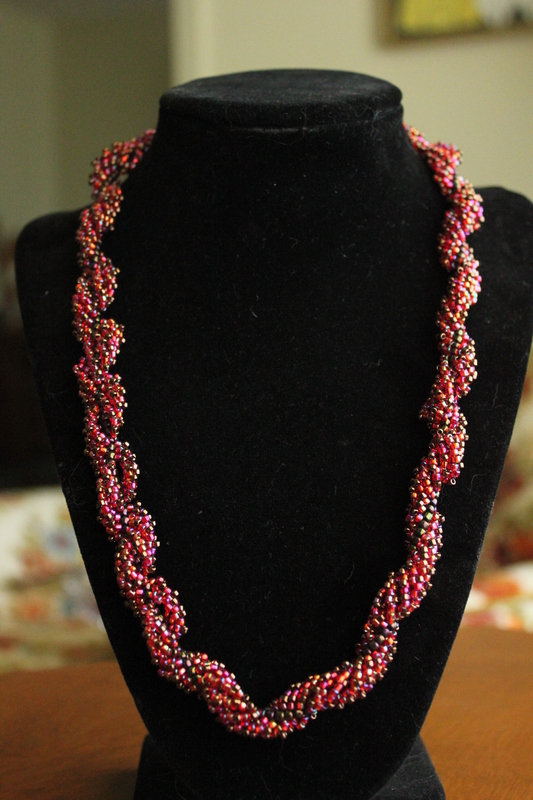 The necklace is from Jill Wiseman’s book, Beautiful Beaded Ropes, the Dew Drop Spiral Necklace. It is an easy pattern with her own twist to the stitch. I’ll probably make more in different colors and add some large beads too. I have to confess that when a project is finished I feel adrift. It’s like reading a good book. You race to the end but when you reach the last word you realize the story is finished and sadly you must move on. Can another beaded or crocheted or knitted project live up to the complexity of the last one? Every time I go through the same ritual. I start and stop a new project until the right one feels comfortable and I am relaxed. Like another good book, I’m off on another ride to the end. This entry was posted in Beaded bracelets, beaded necklaces, Retirement Life and tagged Amy Loh-Kupser, Dew Drop Spiral Necklace, Jill Wiseman, Peyote stitch, Summer Sunflowers, sunflower amulet bag. Bookmark the permalink.